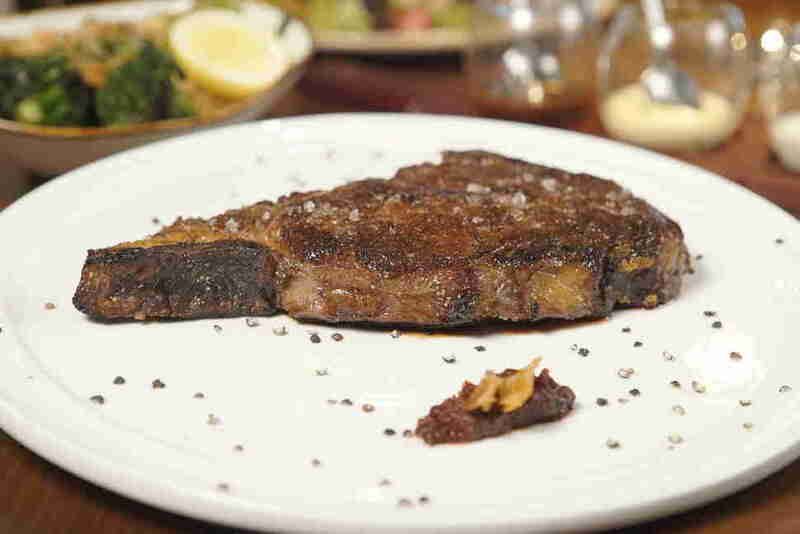 A dry-aged, bone-in rib-eye is a thing of carnivorous beauty, equally delicious splashed with pan drippings, topped with steak sauce, or served with nothing but a sprinkle of salt and a mandatory side of mashed potatoes or Yorkshire pudding. Dry-aged steaks are the pride and joy of many a steakhouse across the country -- a treat for chefs to oversee and for diners to devour. That being said, the initial practice of dry-aging steaks comes off as somewhat… befuddling. Who decided to leave meat out to mold and discovered it actually makes it taste better? 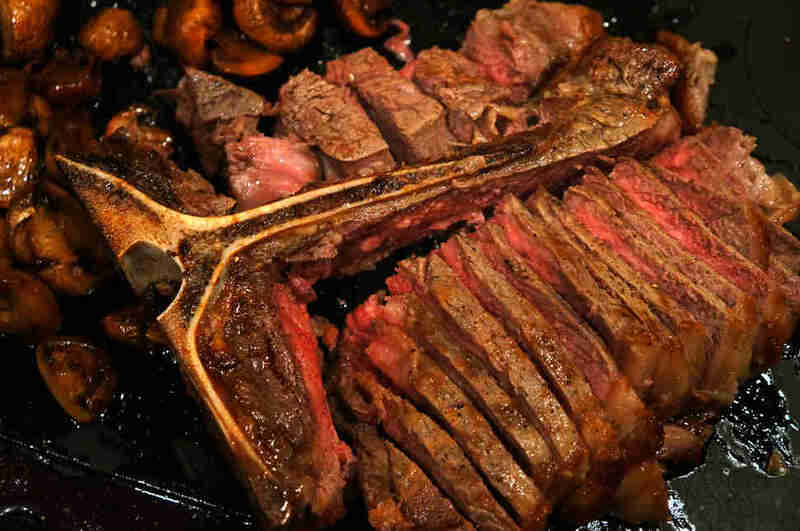 How did this mysterious steak-master control the time, temperature, and taste of the beef? How many iterations were attempted before they discovered how to age steak precisely? Though the answers to these questions remain elusive, there are other questions about dry-aged steaks that are more pressing. Like why, through all that aging, does beef taste so much better -- more flavorful, deeper, and richer? What scientific occurrences are happening while mold steadily grows on meat, which cuts are the best to storm those long days of flavor development, and can one even attempt to capture those flavors at home? To speak to these burning inquiries, I decided to raise the steaks (no, I am not sorry for that) and go on a journey to get all these questions answered -- for myself, for my grateful taste buds, and for you, dear reader, so you don't feel like a pleb for asking them when you're ordering an expensive steak at a fancy restaurant. Here’s what I found out. Why even dry-age a steak to begin with? To put it simply: to make a flavor bomb out of your meat. It’s the same reason we consume aged Cheddar and dive into wheels of moldy cheese with reckless abandon; aged food, when done properly, tastes fantastic. Flavors develop in a spectacularly nutty, funky way that differs greatly from fresh meat. Over time, the meat flavor just continues to concentrate as blood drains from the steak. “Steaks are aged to break down the muscle tissue, which then creates a tender meat,” shared Jack Kawa, the second-generation owner of Omaha, Nebraska's Johnny’s Cafe, which has been selling steaks next to the Stockyards since 1922. There are two ways to age a steak. 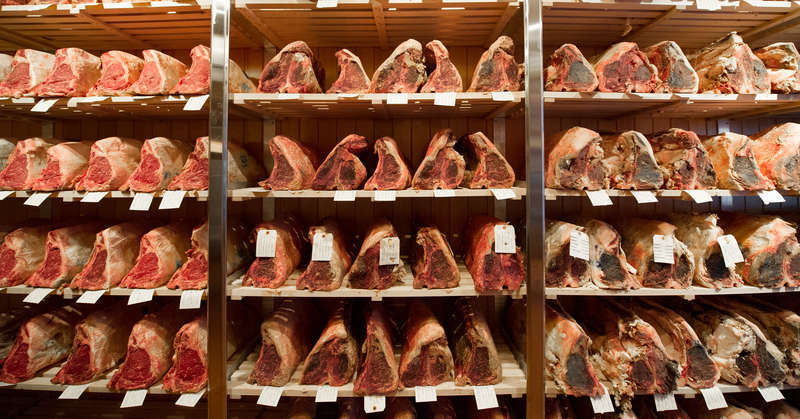 Dry-aging involves leaving the meat to age in a temperature- and humidity-controlled space. Wet-aged steaks go through a process of leaving meat in vacuum-packed Cryovac bags. So why do so many folks swear by dry-aging? The answer has to do with retaining moisture. Ironically, the wet-aging process leaves the meat dryer, at least according to Dean Poll, the owner of Gallaghers Steakhouse, the iconic New York City eatery where Broadway stars and alleged mafia bosses have been dining since 1927. What happens to the meat during the aging process? Poll and Kawa touched upon this briefly, but what’s happening is that the enzymes in the meat are breaking down, resulting in a more tender, juicier steak with a much more concentrated flavor. There's also some shrinkage. “Essentially, the water is coming out of the meat and it’s technically shrinking. 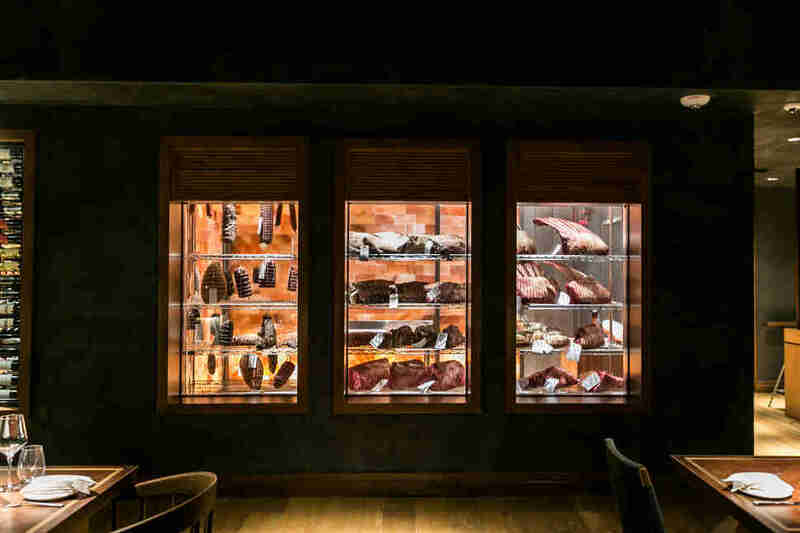 The flavor of the meat is getting more and more intense as it gets denser in the dry-aging process,” revealed Perry Pollaci, Cutthroat Kitchen champ and the executive chef at Castaway in Burbank, California. There's also often mold that forms on the meat. But that's natural too, and while eating a hunk of meat that has mold on it might seem counterintuitive, it's actually just a part of the maturation of flavors. What’s the best method for dry-aging? There are a lot of different ways to dry-age meat. From my research, there is no “best” way -- just different methods to invoke unique, meaty flavors. Some are more elaborate than others. At Castaway, for example, Pollaci has his meat hanging in a glowing, orange Himalayan salt room for all to see. “The salt in the room helps to regulate the humidity of the dry-aging environment. We have it set between 85%-87%. You need the humidity and air circulation as you want that curated growth,” he said. You don’t need anything that fancy, though. 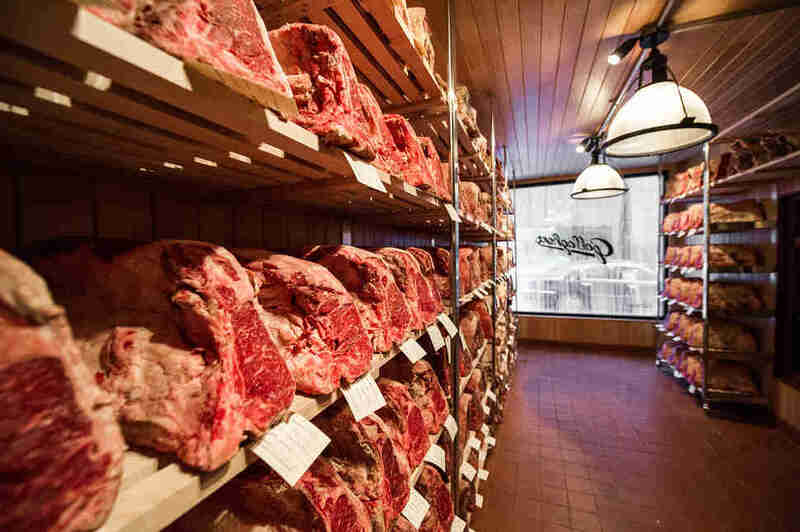 At Gallaghers in New York, the meat is aged in a street-facing meat locker, with fans spinning all day and all night to keep the steaks dry and air moving. For chef Chris Cosentino -- winner of Top Chef Masters and the co-owner of San Francisco’s Cockscomb, Jackrabbit in Portland, Oregon, and Acacia House in the Napa Valley -- dry-aging steaks is about diversity of flavors and thinking beyond tradition. 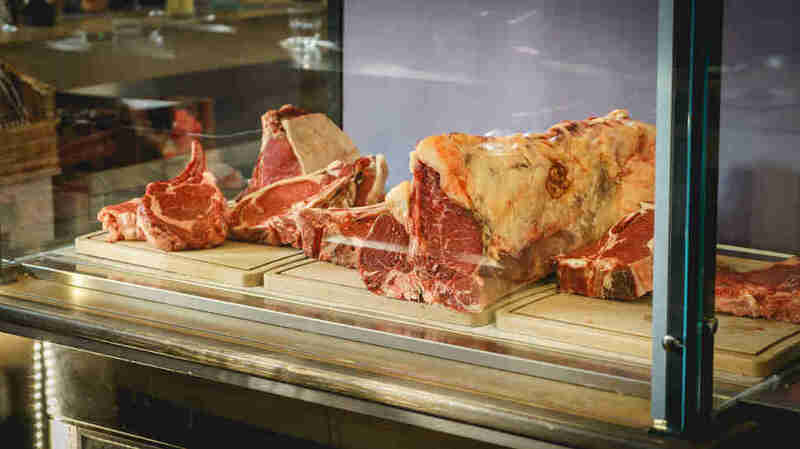 Though both Poll and Pollaci said the cut is arbitrary -- and mostly up to the preference of the diner -- the most common cuts used for dry-aging are ribeye, sirloin, and New York strip. These cuts are chosen because they tend to come from parts of the cow where muscles aren’t used frequently, like the ribs and the loin area, resulting in tender meat as opposed to tougher muscle. It’s good to note that larger cuts, specifically primal cuts, are considered the best candidates. A primal cut, for those of us who aren't butchers, is a larger cut of beef that has yet to be separated into individual steaks (think strip loin, short loin, or prime rib). Those big cuts can can handle aging much longer. At Gallaghers, rib steak, sirloin, porterhouse, and filet mignon are all on the menu and dry-aged in their 52nd street-facing meat locker. What’s the best length of time to age a steak? This also comes down to preference, but the standard length across major steakhouses is 28 days. Some places go well beyond, but 28 seems to be the sweet spot. “If you do it any less than that you most likely won’t taste a significant flavor profile in the meat,” shared Pollaci. Out of his own curiosity, Poll has also ventured out to try longer intervals to see how the meat reacts at Gallaghers. Despite that, it’s up to you to discern what flavor you’re looking for in a steak. If you want something deeper -- more umami, nuttier, and meatier -- there are steaks that are aged longer than the standard 28 days. “The age depends on the cut and the size. It's best to age on the bone with the fat on. The time depends on the flavor profile you are looking for. The longer the steak ages, the more intense and deep the flavor gets,” said Cosentino. Is it possible to dry age a steak at home? In response to this question, Poll looked me in my eyes and said, “Anything is possible.” That being said, should one dry age a steak at home? Essentially, nobody wants a steak that tastes like, well, the fridge. As the steak ages, it also loses a lot of blood, which you may risk getting all over your other groceries if you aren’t careful or using a separate, temperature-regulated fridge. To combat this, Pollaci suggests keeping your aging steak on a rack with a pan below to catch all the drippings, including blood. Though it’s entirely possible to age a steak at home, it might be in your best time and interest to skip steak-aging as a hobby. Instead of investing in a fridge specifically for aged meats or building a customized Himalayan salt closet next to your pantry, maybe splurge at a steakhouse every once in a while and leave the aged beef to the professionals. What’s the best way to cook aged meat? Again, this comes down to preference, but the chefs I spoke to all had different tips and tricks to making the best possible dry-aged steak. For Pollaci, a super-hot cast iron pan and aggressively salt-and-peppered steak is key. Poll likes his steaks cooked the same way they do at Gallaghers, which is over hickory coals (the restaurant goes through bags upon bags of coal a day). Whatever the method of preparation, whatever the length aging that’s occurred, and whatever the cut, at the end of the day, a dry-aged steak is a dry-aged steak. And what that generally means is that it’s going to be delicious -- regardless of it it’s aged in a Himalayan salt room, flamed over a special bag of coals, or basted in butter (though those things certainly don’t hurt). At the end of the day, if your steak wasn’t aged in a fridge that smells like wet cilantro and old cheese, it will probably be a good time. Kat Thompson is a staff food writer at Thrillist and lover of all things beef. She prefers her dry-aged steak cooked medium rare. Follow her on Twitter @katthompsonn.